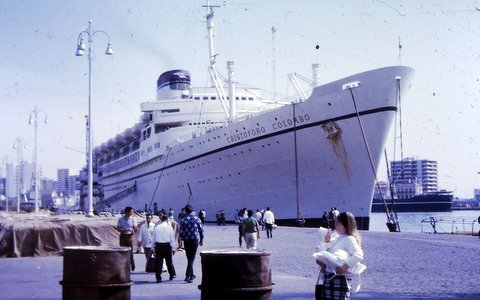 Cristoforo Colombo took Marcia, Steve, and Dawn to Italy, 1970. We did go to Italy. I didn’t learn Italian ahead of time. In fact we went separately. Steve flew there. He flew ahead to find a place for us to live and some work for me to do because I was going to be “putting hubby through,” so to speak. I had a trunk full of our household goods and at that time it was cheaper to go across on an ocean liner and take your trunk than it was to fly. So he flew and I came later. I learned a little Italian on the ship. I was on the Italian lines. I met up with him in Italy there and then I took some Italian lessons when I was there. Basically we learned Italian from just living in the culture. I remember. . . .
[Heidi]: The ship came into Venice. [Steve]: No, that was the second ship. No, that was the second time we went back. The first time it came into . . . um. [Steve]: No, uh, the other side of the peninsula. [Heidi]: I mean, um, Genoa. Genoa! We came into Genoa. [Heidi]: And then you trained across. Yeah. We did a lot of train travel in Padova. [Eric]: While he was in medical school, you were working? So then he found me a job in a Berlitz school, teaching English. So I taught English in a Berlitz school. [Heidi]: Mom did burlesque to bring in the money. And I learned a lot of, you know, I learned a lot of Italian teaching English, just because of the way the Italians would speak English. It helped me to learn how things were said. [Heidi]: Twenty-six years later, I moved to Italy and lived in Venice and taught English in a Berlitz school and learned some of my Italian. [Virginia]: Are you serious? Oh, Heidi, that’s awesome. So after three years in Italy, he took an externship at Saint Elizabeth’s Hospital in Brighton. Came back for a period of six months. I came ahead. I was six months pregnant with Dawn. I came ahead and Dawn was born in the States at that hospital, Saint Elizabeth’s. He was not—were you here for the birth? You were back by the birth time. OK.
Then we went back to Italy and the second time we went back together in a ship. That’s when we went to Venice. On our way there, we stopped in various ports. So we were in Malaga, Spain. We stopped and visited Pompeii and we were in Naples and visited Pompeii. [Steve]: We stopped in Sicily. We did. We stopped in Sicily. And then we went up the Adriatic and stopped in Greece. [Steve]: In Greece. We went to Greece. We stopped at Piraeus. And then we took a day trip to Athens. And then we went over to Venice. That gave us a chance to see a lot of places in Europe and when Dawn was baby, we traveled—when we had vacation times, we had a little VW Bug and traveled to various places, to visit places in Italy. [Heidi]: You went to see Aunt Betty and Uncle Harley. And we went to Austria also because we had met a couple on a ship—he was Austrian and she was American. They invited us to go to Austria to visit them at Christmastime, so we did a few things like that. [Kimberly? ]: Aunt Betty and Uncle Harley. [Steve]: That was up in Switzerland. We had gone also, among other things, we saw where The Sound of Music was designed in Salzburg. They lived in Salzburg, so they took us around to all the sites in Salzburg. We traveled to Switzerland several times and met up with Aunt Betty and Uncle Harley there and Sandy and Debby. They would get apartments for missionaries in various places in Switzerland where we would have vacation time. So we would drive through the fog out of Italy, because it was usually very foggy at Christmastime. Then I can remember one time when we were driving up in the mountains in Switzerland. Steve was not feeling good. Did you ask me to drive? And I was like. . . .
[Dawn]: Dad was in the back seat. Dad, he would look out the window and see that it was a drop-off like this and he just closed his eyes and hoped we didn’t drop off. Anyway, so we had a lot of good memories from those years. We were there for six years. Came home in 1974. Any other Smith and Steve Duncan family stories from those Christmastimes spent together that you’d like to tell? Would someone please tell the flaming fondue table story? Can someone relay the peanut butter story? Didn’t Harley and Betty come to Italy for that story? What was the context? How about going to France to help build the camp one summer story? Sandy? Debby? What do you remember of those intersecting times? Why would Betty have stayed behind in France at Steve’s graduation? Children? Other duties? Finances? Any other stories from the ocean liners? How about the diapers-in-the-hold story from the second crossing? This entry was posted in Betty, Steve and tagged 1967, 1968, 1969, 1970, 1971, 1972, 1973, 1974, Athens, Berlitz, Brighton, Christmas, Dawn Duncan Harrell, Debby Chasteen, France, Genoa, Greece, Harley Smith, Heidi Duncan, Italy, Malaga, Marcia Duncan, Naples, Padova, Piraeus, Pompeii, Saint Elizabeths Hospital, Salzburg, Sandy Moyer, Sicily, Spain, Switzerland, The Sound of Music, Venice, VW Bug on September 9, 2015 by Dawn Duncan Harrell. Mum called Thursday morning to tell me that Uncle Bob had died. On Monday, he was sitting up in the hospice care facility when Aunt Polly returned from a family wedding in Colorado. On Tuesday morning he was unresponsive and they decided to bring him home. Mum spent Tuesday and Wednesday nights with them. On Thursday morning, Mum was holding his shoulders while the hospice caregiver bathed him. He opened his eyes wide and stopped breathing. How many people felt the air go out of them when they heard that news. Expected perhaps, but not welcome. Death never is. God comfort my Aunt Polly, my cousins Andy, Gene, and Colin, my dad and his sisters and brother. We all feel so sad. Uncle Bob is most assuredly not sad. He’s been longing to hear his “well done, good and faithful servant” (Matt 25:21) for a while now. “I want to be at home,” he told me several times during those long months in the hospital. When he opened his eyes wide, I’m sure he was taking his first look at the Home of all homes. He would have recognized it. After all, he and Aunt Polly created a home, not just for their children, but for me and my three sisters, for their many other missionary kid nieces and nephews, for the larger family, for their church families, for just about anybody who needed to feel welcomed. My dad tells the story of Uncle Bob catching heat from Aunt Polly when he even welcomed some hippies to set up their tent on the Duncan front lawn, years before I ever moved in. For many of those years, Uncle Bob and Aunt Polly’s house was my Grandmother Duncan’s home, too—the family seat. When I was a kid, we would drive to the Fort Square parsonage for holidays and birthdays. Far flung family, returning from Illinois, Georgia, California, France, Peru, Colombia, and beyond, could be found in their house. All through high school and college, their home was the one to which I returned during vacations. During one of my school breaks, I heard Uncle Bob praise me to my parents, “I’ve never walked into my own kitchen and had anyone ask me what they could get for me.” This might sound self-serving until you know that meeting other people’s needs, predicting and supplying them seamlessly was my childhood “job,” my role in the family, but no one had ever noticed that out loud. Uncle Bob saw it in me. He saw me. And for an adolescent girl, who wouldn’t figure out who she was for another fifteen years, being seen and celebrated was profoundly important. He saw into many of our souls. Uncle Bob became my second father. There were things he could say to me, which I couldn’t have heard from my own dad. As a young adult in crisis, I craved his voice of wisdom, though it was probably the quality of his listening and his sense of assurance that changed things for me. And not just me. Years after he’d left one church, a troubled parishioner would still call him at home, usually at dinnertime, and pour out her anxieties. He always took that call. He could listen, but Uncle Bob could speak firmly, too. During Urbana ’97, which we attended together, we met for lunch one day. I told him about a young roommate who was asking me many questions concerning women in ministry, which is still a controversial topic in some churches. Though I myself was in seminary, I’d counseled her cautiously because I didn’t want to get her in trouble with her elders. “It doesn’t sound like that is what she needs to hear right now,” he challenged me. He was a good preacher, too. He’d trot out his sermon ideas during Saturday night dinners and I enjoyed listening to him weave them together on Sunday morning. He delivered the homily at my wedding seven years ago, driving with Aunt Polly from Ballston Spa in New York even though they had to turn around just hours later so he could be home to deliver the sermon on Sunday morning. Being a preacher was good, but what he really wanted to be was a missionary. At least, he really wanted to experience the world. Before he tried seminary, he tried the armed forces, but they wouldn’t send him overseas because of the metal pin in his leg, the result of a youthful motorcycle accident. He and Aunt Polly even moved to Costa Rica temporarily to learn Spanish during the early ‘90s just to see if this wouldn’t morph into a call to missions. One time he and Polly were lost in Morocco. They’d eaten something that disagreed with them. It was hot and they were out of water. And now they were in danger of missing the ferry back to Spain. Afraid and unable to find anyone who spoke English, they leaned against a wall and prayed. Seconds later an old woman touched him on the arm and motioned for them to follow her, which they did. She led them back to the boat, but when they turned to thank her, she was gone. Years later, he still claimed that God had sent them an angel. There wasn’t anywhere he wouldn’t go. And if he couldn’t fly, he drove. He loved to drive and he loved cars. On one long trip, we stopped at a gas station for a break. Heading back to the station wagon, he detoured to an old Studebaker. Without a qualm, he pulled open the door and leaned in to inhale. “I just wanted to smell it,” he explained. There were many drives to and from college and during one, he collected me at my roommate’s house. “Whadya got in here, a dead minister?” my friend’s dad teased as he hoisted my suitcase into Uncle Bob’s car. Then realizing that Uncle Bob was a minister, he blushed and apologized, but Uncle Bob was too busy laughing. Laughter and tears came easily to Uncle Bob. He enjoyed music and reading, filling his theological shelves with all comers. “Don’t read that commentary,” he exclaimed one day when he found me in his office after Sunday worship. He didn’t think the author’s scholarship was sound, but the book was still on his shelf. Another time, he lent me his favorite book A Severe Mercy by Sheldon Vanauken. “What is it,” I asked? “A love story about a couple who try to build the perfect love between them. It’s a selfish love, though, because its only expression is inward.” In that book Uncle Bob recognized his own ideal as well as the temptation to selfishness curled up inside. Uncle Bob was unselfish, a good minister. He preached well. He pastored empathetically. He visited the sick constantly. 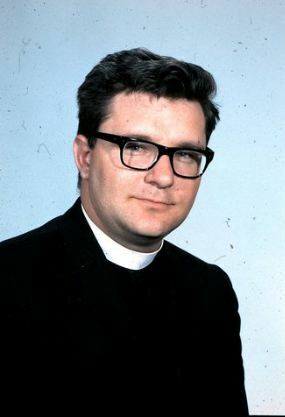 He used to wear a clerical collar when he went to the hospital to keep security and nurses from questioning his motives. This earned him the honorary “Father” because people thought he was a Catholic priest, and some not so honorary glares when people saw him with his beautiful young wife Polly sitting in the front seat of a car together. During this past year in and out of hospitals, his ministry to his own caregivers continued. Word of his testimony filtered back to me through many sources: Our daughter’s babysitter’s husband played cards with him a couple of times and I heard about his love for Jesus. A woman who knew one of my co-leaders in ministry was married to one of his doctors. I heard about his faithfulness from her. His family and I are grateful to all those who cared for him and for Aunt Polly through this final, hardest sickness. My sisters and cousins and I cannot properly thank Colin, Gene, and Andy for sharing their parents with us. Uncle Bob and Aunt Polly leaned on God for their apparently endless store of family love, but I know it was sometimes your space that we took up. All of us in the church families that they served have a debt of gratitude to you. Thank you for sharing even your grieving space with us. The last time I heard Uncle Bob pray, we were together in one of his hospital rooms. I was taking up his grandson’s space, so I gave hugs and turned to Uncle Bob. He held out his hand. He was misquoting Psalm 139, applying it to himself as he looked ahead to his new day. It reads, “If I rise on the wings of the dawn, if I settle on the far side of the sea, even there your hand will guide me, your right hand will hold me fast. If I fear, ‘Surely the darkness will hide me and the light become night around me,’ even the darkness will not be dark to you; the night will shine like the day, for darkness is as light to you” (vv. 9–13). Even this darkness is as light to our God. Uncle Bob has risen on the wings of the morning. Our turn will come. Do you recall other stories about Bob as an adult? Please tell us. Do you have a Bob preaching story? A visiting Bob story? A Bob’s book story? A Bob traveling story? Can Did you live with Bob as a child while your parents were elsewhere? What stands out to you? Do you have a story of that time to tell? Did Bob perform your wedding ceremony? How did it go? What do you remember about it? This entry was posted in Bob, Virginia and tagged A Severe Mercy, Andy Duncan, California, Chicago, Colin Duncan, Colombia, Costa Rica, Cuba, Dawn Duncan Harrell, France, Gene Duncan, Georgia, hippies, hospice, Israel, Marcia Duncan, Matt 25:21, Morocco, Peru, Polly Duncan, Ps 139, Sandy Moyer, Sheldon Vanauken, Studebaker, Urbana '97 on August 15, 2013 by Dawn Duncan Harrell. As far as the approximate dates for the sled “incident” (when your dad grabbed my foot as I headed for traffic), I believe it was in latter part of 1960, early 1961. I remember my folks were concerned that JFK was going to be elected president (which he was, obviously). So I am guessing possibly November/December 1960. I would have been seven years old. Your dad [Steve] still lived at home. He had a wonderful German shepherd named Princey. I was just speaking to my mother [Betty] about the dog, and I told her that I remember that his food bowl was out in the enclosed porch. She reminded me that your dad had trained him a bit. He would say to Princey: “Stay . . . stay . . . stay . . .” and the dog would look longingly at his bowl but not move toward it. Then your dad would say, “OKAY!” and the dog would make a beeline to his food. I loved that dog; he even walked me to school which was just a couple of blocks away from Grandma and Grandpa’s house. This occurred outside of 16 Washburn Avenue on the hill in front of the house. We did have a sidewalk in front of the house before the road, but the sled twisted, turning right into a road. Coming down the road was a car and a sheet of ice. I was where she passed and I reached out and grabbed her foot and kept her from getting in the way of the sliding car. I guess that I was about twenty years old, home from Boston University, prior to going into the army. Betty and Harley were unquestionably home for furlough and we all took advantage of the snow and the wintertime sport. I don’t think that I was so impressed that I was a hero, as Sandy might have remembered, but I like the idea of being thought of as such. My Brother Tad, who was called Junior at the time, was probably in the Air Force at the moment and others of the family were not about. Who was doing the cooking? I’m not sure. I would imagine it was the work of both Grandma Duncan [Virginia] and my sister [Betty]. What do you remember about Princey? What other pets did the family have over the years? What were other family members doing near the end of 1960/beginning of 1961? This entry was posted in Betty, Steve, Tad and tagged 16 Washburn Avenue, 1960, Air Force, Army, Boston University, John F Kennedy, Princey, Sandy Moyer on November 28, 2012 by Dawn Duncan Harrell. This is a rare are the pictures of Grandpa [Taylor] smiling. Here are a few special memories I have of Grandpa: his giggle (believe or not); he would say “wishee” every time he sneezed; and watching Wagon Train, Gunsmoke, and other classic TV series with him. We lived with Grandma [Virginia] and Grandpa for six months when we were back in the USA on furlough [1960/1961]. In the picture, I see many stories. But first Grandpa, or as I knew him it was Dad. I think the picture of him smiling was not the image that I recall most. I was born when he was 52 years old, my mother was 40 years old, and I was indeed unexpected, delivered by caesarean section and an addendum to his seven prior children. I remember dad as a stern disciplinarian, who was often not at home because he was teaching at the Bentley College, now Bentley University. I was simply the child that came along after my mother’s gynecologist said, “You will have no more children!” Never trust a doctor!!! Two of the children before me were half siblings and the other five were all older than myself. In the picture, I was the smallest, about ten years old if the number “50” in the corner of the picture represents 1950. Lee, in her nurses graduation uniform, is pictured beside the sofa. Dad, or Grandpa, was posing for a photographer, which was Wally’s friend, a colleague from the Gordon College where he was attending. 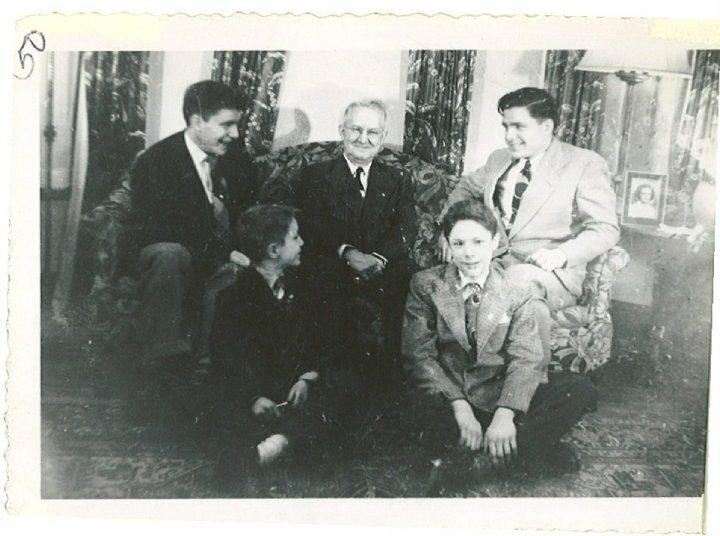 Wally, being the older of the boys in our immediate family, was more of a role model that was my occasionally-home father. It was his craftiness that I emulated and even some of the harebrained ideas. Sometimes we called that vision! Anyway I got it. Wally was away at college frequently in Boston, where Gordon College was situated at that time. He always had some idea or project and I admired that. He started the youth work called Crusade for Christ and it was at those meetings where Betty and Harley met; that eventual marriage was not his idea though. Bob was born after Betty, who was not in the picture at all. As I recall Bob, the most outstanding memory is that he spent time with me to help me learn some—believe it or not—Latin and some other subjects. It never seemed like he was caught up in crazy projects, which I was to emulate, but a lot more serious in study and learning. He was always fun. TAD (Taylor Albert Duncan, “Junior”) was the next sibling in line and closest to my age. As I recall, in his younger years he was a good student and a good worker, earning more money than the rest of us. He had more tools and better tools and we competed between us, even though there were only two and a half years separating us. I was always a little tag-along and unfortunately, frequently, especially in the younger years, a crybaby. He was a challenge for me and I always thought him smarter than I was. I thought of him as being the one who did things in the nonconventional way, but he was there in school with me. Dad was proud of his boys but sometimes we tried his patience. The smile could have been for many reasons. That was my Dad. What do you remember about Grandpa/Dad? What do you recall of his sons Wally, Bob, Tad/Junior, and Steve at those ages? What was happening to you in 1950? What house was this photo taken in? This entry was posted in Bob, Steve, Tad, Taylor, Virginia, Wally and tagged 1950, 1960, Bentley College, Crusade for Christ, Gordon College, Gunsmoke, Sandy Moyer, Wagon Train on October 24, 2012 by Dawn Duncan Harrell.